Following the battle of Antietam on September 17, 1862, Union General George B. McClellan allowed Confederate General Robert E. Lee and his troops to retreat back to Confederate territory in Virginia. A few months later, President Abraham Lincoln relieved McClellan of his command of the Army of the Potomac. He did not receive another military assignment, but stayed with his family in New Jersey. In 1864, McClellan was nominated by the Democratic Party to challenge Lincoln for the presidency. This Leslie’s Illustrated cartoon asks why McClellan had not resigned his position as major general in the U.S. Army. The cartoonist’s answer is that the Democratic nominee continues to draw a military salary of $8000 (about $91,000 in 2002 dollars) and is not likely to collect the presidential salary of $25,000 (about $285,000 in 2002 dollars). 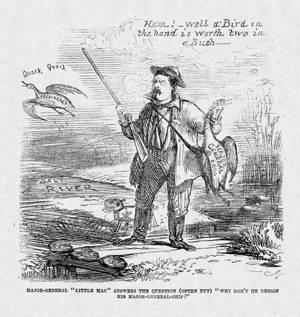 In the cartoon, McClellan is a duck hunter who holds the “Major General” bird in his hand while the “Presidency” bird flies away over the Salt River, a slang term for political defeat or oblivion. After losing the presidential election, McClellan finally resigned from the army on November 8, 1864.